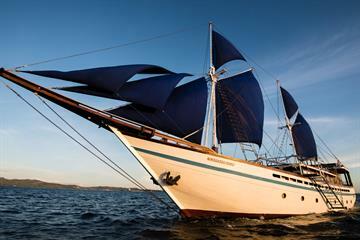 Liveaboards in Alor in the Lesser Sunda Islands are the ideal get away from it all dive trip. If you dream of perfect isolation, crystal clear waters and eye popping corals then liveaboard diving in Alor is definitely for you. 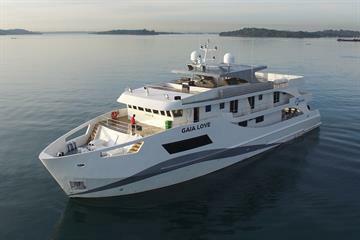 Now a lot of Indonesian liveaboard diving offers tranquil waters and corals but Alor liveaboards have the added bonus that the dive tours often happen to double as a whale and dolphin watching tour. There are a substantial number of cetaceans in this part of the Banda Sea and there is a good chance of seeing them from your dive cruise. The island is volcanic like many of the other Lesser Sunda Islands and there is some fantastic underwater topography including lava flows and black sand banks. The lava flows are caked in corals and the black sand is full of critters for muck diving. The scenery is of course beautiful and sparsely inhabited which means that sailing in Alor is a serene experience by itself. There are a few settlements on land but for the most part the island is very peaceful. Like most Banda Sea diving the conditions for scuba diving in Alor are fairly good in the season, which is March to December. The currents in this area are however a little stronger than other parts of the Banda Sea but luckily that means the chance to see bigger animals as well as the usual host of critters assocaited with this part of the world. When you first dive down in Alor the colour of the corals on the reefs first hits you. The area is full of coral reefs and there are huge numbers of reef fish to go along with it. You can also see frogfish, snappers and barracuda there too. Not only that, but there are white tipped and grey reef sharks patrolling around the reefs or sleeping with their tails sticking out from under table corals. A liveaboard tour in Alor will take in a number of excellent sites but Sharks Galore is a must on any Alor dive cruise itinerary. This is the place to see grey reefs sharks, these big guys can be seen swimming over the reef along with white tipped reef sharks and tuna. There are many fantastic macro sites in Alor but this is the place for the bigger beasts. The twilight zone, or Biangabang beach, on the other hand is critter paradise. The area is full of hot springs and volcanic sand perfect for muck diving. There are sea moths and mantis shrimp to delight photographers and it makes for a wonderful night dive too. Bring extra thermal protection as deep upwelling currents can leave the water pretty chilly. This really is a remote destination so make sure to bring spares of anything you can’t live without. 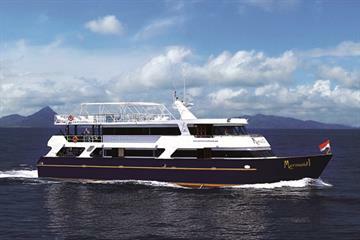 The remote location of Alor means that a liveaboard diving is the best way to see as much as possible, with most dive tours offering three or four dives per day. 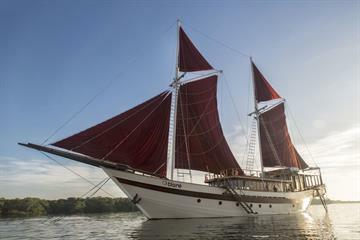 There are a few options when choosing liveaboard boats in Alor. 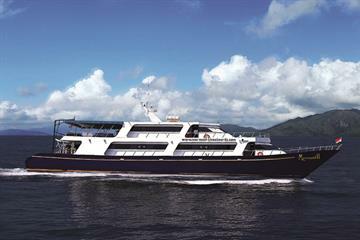 Luxury liveaboard motor vessels offer comfort and excellent facilities. If you would like to try sailing in Alor the traditional Indonesian sail boats are the most tranquil and authentic way to do a liveaboard tour in Alor. 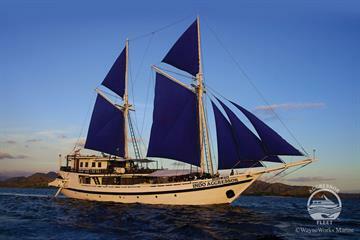 Most liveaboard diving in the Alor area depart from Maumere port or occasionally Labuan Bajo. The easiest way to get there is to fly to Labuan Bajo from Bali International Airport. If you are staying elsewhere in Indonesia there are some domestic flight to the small airport at Maumere. Great, good mix of dive sites, however cold water at a few sites means you need the correct wetsuits.